Synthetic peptide within Human FOXA2 aa 350-450. The exact sequence is proprietary. Our Abpromise guarantee covers the use of ab193879 in the following tested applications. Transcription factor that is involved in embryonic development, establishment of tissue-specific gene expression and regulation of gene expression in differentiated tissues. Is thought to act as a 'pioneer' factor opening the compacted chromatin for other proteins through interactions with nucleosomal core histones and thereby replacing linker histones at target enhancer and/or promoter sites. Binds DNA with the consensus sequence 5'-[AC]A[AT]T[AG]TT[GT][AG][CT]T[CT]-3' (By similarity). In embryonic development is required for notochord formation. Involved in the development of multiple endoderm-derived organ systems such as the liver, pancreas and lungs; FOXA1 and FOXA2 seem to have at least in part redundant roles. Originally discribed as a transcription activator for a number of liver genes such as AFP, albumin, tyrosine aminotransferase, PEPCK, etc. Interacts with the cis-acting regulatory regions of these genes. Involved in glucose homeostasis; regulates the expression of genes important for glucose sensing in pancreatic beta-cells and glucose homeostasis. Involved in regulation of fat metabolism. Binds to fibrinogen beta promoter and is involved in IL6-induced fibrinogen beta transcriptional activation. Phosphorylation on Thr-156 abolishes binding to target promoters and subsequent transcription activation upon insulin stimulation. Nucleus. Cytoplasm. Shuttles between the nucleus and cytoplasm in a CRM1-dependent manner and in response to insulin signaling via AKT1 is exported from the nucleus. 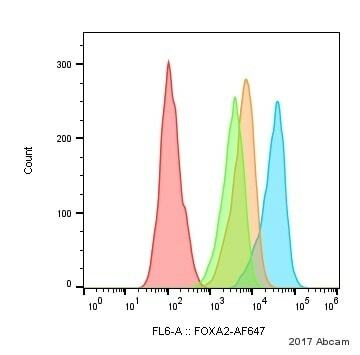 ab193879 staining FOXA2 in HepG2 cells. The cells were fixed with 4% formaldehyde (10 min), permeabilised in 0.1% Triton X-100 for 5 minutes and then blocked in 1% BSA/10% normal goat serum/0.3M glycine in 0.1% PBS-Tween for 1h. The cells were then incubated with ab193879 at a working dilution of 1 in 50 (shown in red) and ab195887, Mouse monoclonal [DM1A] to alpha Tubulin (Alexa Fluor® 488, shown in green) at 2µg/ml overnight at +4°C. Nuclear DNA was labelled in blue with DAPI. Publishing research using ab193879? Please let us know so that we can cite the reference in this datasheet. Single nuclei were selected based on FSC-A x FSC-H. Cell harvesting/tissue preparation method: Brain tissue was dounce homogenized and nuclei were extracted using a sucrose gradient. The nuclei were resuspended in 1x PBS supplemented with 0.1% triton-X100 and stained with the a-FOXA2-AF647 antibody (ab193879) at a dilution of 1:50 (blue), 1:250 (orange) or 1:500 (green). Unstained nuclei were used as control (red). Sample buffer: 1x PBS w/o calcium and magnesium supplemented with 0.1% triton-X100 for permeabilization.